A potato farmer from Ballarat, Danny Frawley debuted for the St Kilda Football Club in 1984 at age 20. After beginning his career as a forward he forged his career as a fullback. He played 226 games which included 9 years as captain of the club. Danny represented Victoria in State of Origin competition in 1987 and was named All-Australian and St Kilda’s best and fairest in 1988. In 2007 we was inducted into the Saints Hall of Fame. In 2000 Danny took the reins as head coach of the Richmond Football Club, taking them to finals in 2001, the club’s first since 1995. 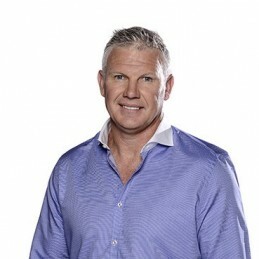 Since leaving Richmond in 2003 he began a career in the media providing special comments on Triple M radio and Fox Footy television broadcasts. Danny is also a long time co-host of After the Bounce with Jason Dunstall and has served as the Chief Executive of the AFL Coaches Association.